Large enough for a family to enjoy through the season, we recommend sending this Christmas gift basket early so they can enjoy it leading up to the holiday. Features a classic large, plush Santa shelf-sitter with dangly legs that will become a cherrished holiday decoration for years to come. This large holiday gift basket includes a decorative sugar plum cookie plate. 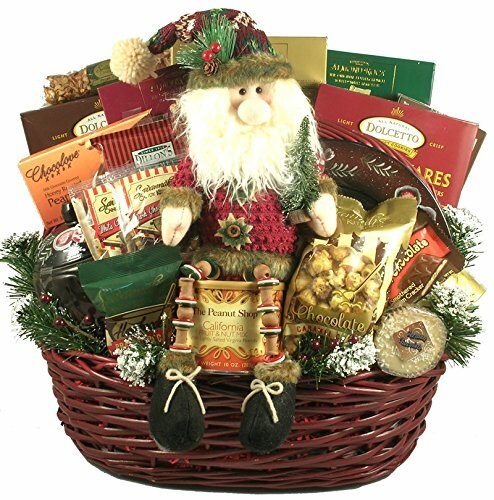 Large enough for a whole family, an office staff or one really lucky individual, this large holiday gift basket is sure to get rave reviews. This special holiday gift basket is loaded with so many of our favorite snacks that anyone who receives it will be thrilled! Proudly Made in the USA by our team of professional gift basket designers when your order is received and usually ships the same day.